Blog How to Soundproof a Drop Ceiling Cheap - 6 Effective Ways! 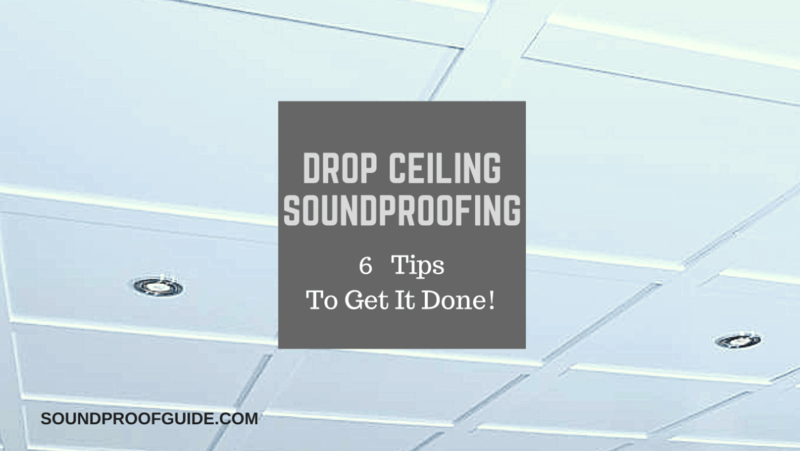 How to Soundproof a Drop Ceiling Cheap – 6 Effective Ways! Is a lot of the noise from upstairs finding its way into your basement and shattering its serenity? This can be extremely annoying, primarily if you’ve dedicated your basement to alone time for work or meditation, or some other activity that requires peace and quiet. The good news is that you don’t have to keep putting up with all the upstairs racket because we are about to show you how to make your basement as quiet as a library by soundproofing your drop ceiling. A typical basement is naturally soundproof because of its unique location under the house and the fact that the earth insulates it around it. But depending on how active and noisy the members of your household can be, a lot of the noise from upstairs can still find its way into the basement through the drop ceiling. There are actually quite a few options available concerning how to minimize how much noise can get past your drop ceiling. But the most effective option or options will depend greatly on exactly what type of noise you are trying to keep out. Drop ceilings are already designed to be quite resistant to sound transmission. This is why they are typically the first choice for a basement ceiling. But for people who want perfect silence, the sound barrier provided by a drop ceiling may not be sufficient. If you want better soundproofing, you can further insulate your basement’s drop ceiling against sound penetration with any of the following options; The 6 ways will get the job done if you’re looking for ways on how to soundproof a drop ceiling cheap! For sound to be able to vibrate through an object, the object itself must be able to vibrate. This is why extremely dense materials make for great soundproofing as they are too thick to vibrate. To boost the soundproofing of your basement’s drop ceiling, you can add mass to it to create greater density and minimize its ability to vibrate and transmit sound. You can accomplish this by adding sound-reducing products to the drop ceiling such as specially designed dense tiles or dense plates. This will increase the ceiling’s mass thus increasing its vibration resistance and minimizing its ability to transport sound. Even though a drop ceiling puts space between the floor above it and itself, it can still transmit vibrations from above. The space between the drop ceiling and the floor above can be further insulated by filling it with a sound-absorbing material. Fiberglass is a great option for this. Fiberglass has been tested and proven to be effective for insulating against sound as it can absorb impact noise and keep it from passing through. It can also block out airborne noise. The light fixtures, ductwork, vents and other systems inside a drop ceiling can serve as effective transmitters of vibrations and sound. The ability of these fixtures to transmit sound and vibrations can be minimized by coating them with sound-damping paint. This solution will stop such systems and fixtures within the drop ceiling from carrying sound around and shattering the basement’s peace. Installing acoustical baffles within the ducts can also help optimize the soundproofing by stopping sound from traveling through the air in the duct. Airborne sound needs only the tiniest space to seep in through. This is why even if you soundproof a whole room, a single gap in the installation can render the whole venture pointless. To keep airborne noise from making its way through the basement drop ceiling, all evident gaps in the floor above must be sealed. This includes any cracks in the ceiling that can allow sound from upstairs get downstairs. Caulking seals can be used to seal the gaps from the top. Just remember that if you choose not to block all gaps, any other soundproofing measure you put in place will likely be pointless. With thick, fluffy carpets on the floors above the basement, both impact and airborne noise from above will be greatly reduced. To make the carpet or rug more effective in minimizing noise, adding padding beneath it will be hugely beneficial. This padding between the carpet and the actual floor will make for an extra buffer that stops the noise and vibrations from penetrating the floor into the basement. Generally, acoustic foams aren’t very effective for soundproofing ceilings. For walls they are great at absorbing noise, but for ceilings not so much. But ATS acoustic panels are a completely different matter. These panels are unlike typical acoustic foams, and you can tell by just looking at the two side by side. ATS acoustic panels are covered with microsuede which boosts not only the aesthetics of this soundproofing material but also its effectiveness. By adding ATS panels to your basement ceiling, a lot of the noise from above will be kept out, and it doesn’t matter if the sound is impact or airborne. Installing ATS acoustic panels are a fairly straightforward affair since the panels come with hooks of their own. These hooks can be used to attach the panels, or you can opt for using glue to stick them to the ceiling. Finding the Best Acoustic Ceiling Tile. To determine how effective a ceiling tile is at blocking out sound, one will have to look at the ratings of the ceiling tile material. These ratings are called the Noise Reduction Coefficient, the Ceiling Attenuation Class, and the Sound Transmission Class. Ceiling Attenuation Class (CAC) is used to measure how effectively a ceiling tile material can prevent sound transmission. This rating system is what to focus on if what you are looking for is a ceiling tile that can block sound from passing through it from the room above. For example, sounds that pass through a ceiling tile will reverberate within the space between the structure’s framework and a drop ceiling, then bounce into a nearby room or back into the room it originated from. When a tile’s CAC is 34 or below, its soundproofing capabilities are considered to be low. But when the rating is 35 and above, it is a high-performance sound blocker. A type of ceiling tile with high CAC rating that is considered an effective sound blocker are mineral fiber tiles. 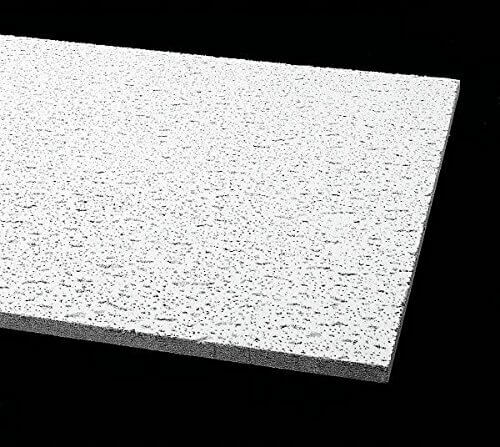 The NRC describes how a ceiling tile material responds when its surface is struck by sound waves. A higher score indicates that the tile is more capable of absorbing sounds. Unlike the CAC, the Noise Reduction Coefficient (NRC) rating system scores ceiling tiles between 0 and 1.0. The higher the score, the more sound the ceiling tile material can absorb. An NRC of 1.0 indicates that the tile can absorb any sound that hits it while an NRC of 0 indicates that the tile will reflect and disperse any sound that hits it. Sound Transmission Class (STC) refers to how effectively a soundproofing material can stop sounds from passing through. Unlike other rating systems, the STC is more about measuring sound blockage than absorption. That is, how well a tile can stop sound from passing through it. But the STC rating system doesn’t explain what happens to sound after a tile blocks its transmission. Its only focus is a tile’s ability to prevent sound transmission. The STC rating scores the sound blocking capabilities of a tile with scores between 1 and 100, sometimes higher. If a material has a rating of 25, it means the sound transmission is minimized but can still be heard. For example, with soundproofing materials with a score of 25, you will still be able to hear from your basement conversations going on upstairs. But with soundproofing material with a score of 60 or more, the sound is effectively blocked from being transmitted out of the room or into the room. Finding the best soundproofing solution for your basement drop ceiling will require comparing all three ratings referred to above, especially when considering what tiles to use for your basement ceiling. For instance, a tile with a low NCR score will not be able to absorb much of the sound that you are trying to keep out or keep in. On the other hand, tiles with an STC score of 60 or higher will stop sounds from getting out or into the basement but not necessarily stop them from getting in. End of the day, what you really need to be on the lookout for is a soundproofing material with a high CAC number. Click here to check out which acoustic ceiling tile I recommend. There are a variety of acoustical ceiling options with the right ratings to keep out unwanted sound. A benefit of installing acoustical ceiling tiles as part of your drop ceiling system is that they deal with the problem at the source by adding effective soundproofing to the basement’s ceiling. Another benefit of acoustical ceiling tiles is that they are affordable and installing them is fast and straightforward which means you can begin enjoying a soundproof basement in less time and with less hassle. For better results, you can combine the installation of acoustical ceilings with any of the other soundproofing solutions we mentioned earlier, especially carpeting the floors above the basement ceiling. Let’s take a quick look at the types of noise that may be breaching the tranquility of your basement. In a basement, the types of noise that you might need a soundproof drop ceiling to protect you against are Airborne Noise and Impact Noise. Airborne noise can be simply described as the sounds traveling through the air and sailing down into the basement from the rooms above. This sound might be generated by people talking, singing or laughing. Airborne noise can also originate from TVs, radios, passing cars, and other sources. What makes airborne noise unique is its ability to bounce off the ceiling or floor and travel right through into your basement. Impact noise is a whole other matter. This type of noise is generated as a result of something hitting the drop ceiling of the basement from above. Good examples of impact noise would be the sound of heavy footfalls passing over the basement or the sound of someone dropping or dragging something on the floor right above the basement. The sound of such an impact will cause vibrations on the floor, which will be transmitted through it and exit downstairs out through the basement’s ceiling. 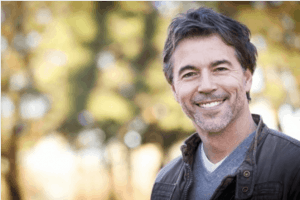 If you are going to put in place soundproof drop ceiling in your basement, these are the types of noises you are going to be trying to keep out. Fortunately, you don’t have to use different types of soundproofing to solve each type of noise as there are drop ceiling soundproofing options that can effectively take care of both. With these effective drop ceiling soundproofing options, not only will you be keeping out noises that can transmit through the ceiling, but also noises that may travel into the basement through joists and beams. The acoustical drop ceiling tiles with the right rating and capabilities will provide soundproofing by either absorbing the sound waves or by blocking them. Instead of having to settle for acoustical ceiling tiles that do one and not the other, the good news is that there are ceiling tiles that do both equally well. By installing the right acoustical ceiling panels as part of the drop ceiling in your basement and combining it with other soundproofing solutions, you will finally be able to enjoy your basement regardless of what sort of dickens the other members of your household are up to.